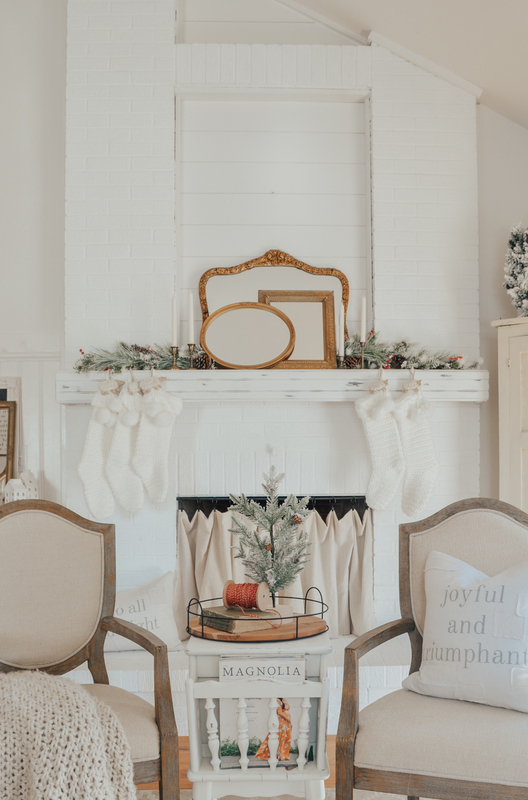 I know some of you might be getting tired of Christmas decor and probably want to see something else here on the blog, but I just can’t help it. I feel like my brain is completely consumed with holiday decorating right now. Ok, maybe that’s a tad bit dramatic. It’s not completely consumed, but I’d say it’s become an obsession. Holiday baking and eating is also on my mind right now, but that’s another story. By the way, would you guys like to see some of the holiday treats we make this time of year? Let me know in the comments below. OK, let’s move on to today’s post! 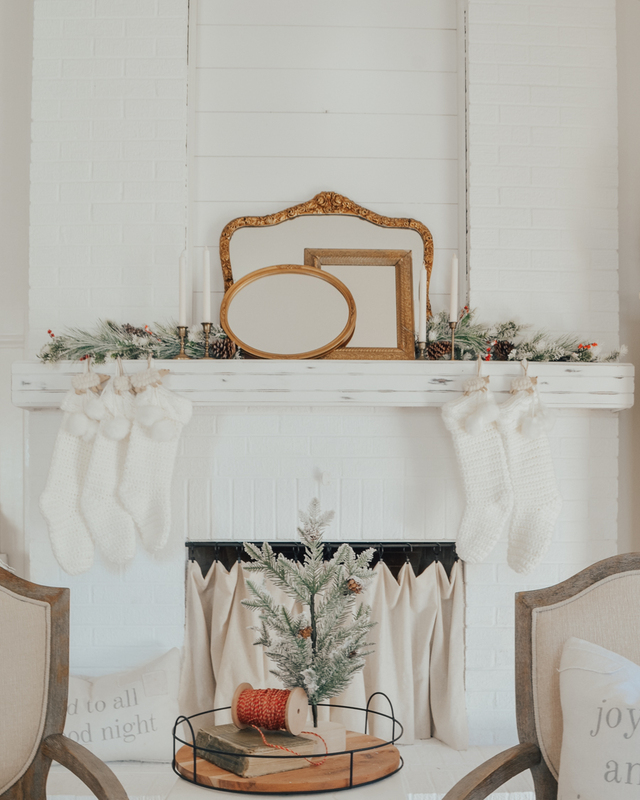 I’m sharing a simple but beautiful vintage Christmas mantle. This is actually one of my favorite mantle looks ever shared here on the ol’ blog, so I hope you all like it too. It’s so simple and easy, which is the best part. And I just used a few antique mirrors and candlesticks. This fireplace is on the other side of our front room and it rarely makes it on the blog. I’m not really sure why, because I love this fireplace and painting it was one of the first big projects I ever shared. If you’ve been around that long then BIG HUGS to you. You are awesome. Anyway, we painted it white, to compliment our vintage decor, and I shared all about that process in this post. It was SO easy and I’ve loved it ever since. The cool thing about this mantel is that I put it together with completely thrifted finds. I found the large mirror in the back for $35 at an antique store. Can you believe that?! It totally reminds me of Anthropologie’s mirrors, which are crazy expensive. The smaller frames were thrifted as well. They had canvas prints in them, so my dad was kind enough to replace those with mirrors. The candlesticks are thrifted too–those were all found at the same antique store. BOOM. Vintage mantle done. I looooooove these chunky kit stockings and they are SO affordable. And I found those adorable little sheep and bear ornaments at Target for just $3 each! 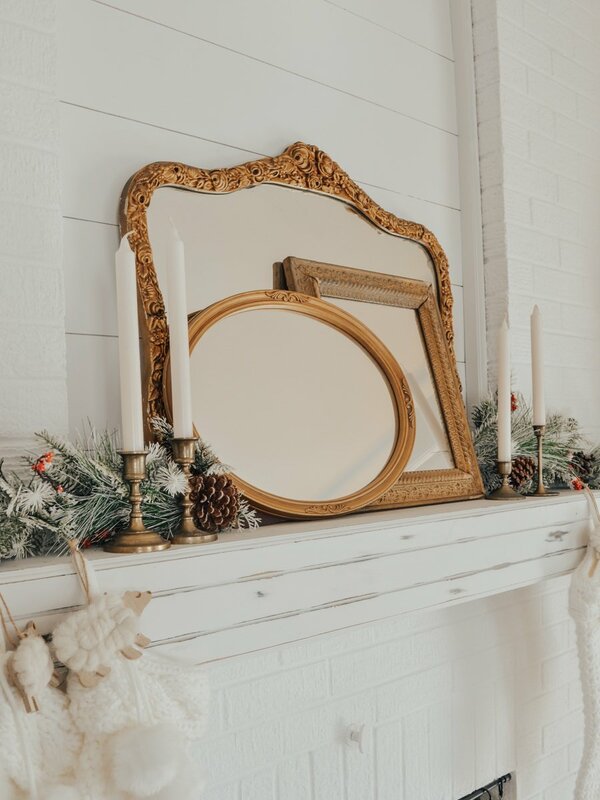 I don’t share mantle looks very often, but I wanted to share this one today because I’m just loving how those mirrors look with the antique candlesticks. Simple, but it’s such a classic and timeless look. I’ve been so inspired by vintage mirrors lately, I feel like they’re popping up all over Pinterest these days, so I’m tickled pink to have a few of my very own. And you guys should be so proud of me because I didn’t paint them!! I left the candlesticks AND the mirror frames completely alone. Can you believe it? It’s a Christmas miracle! Thanks so much for stopping by today! 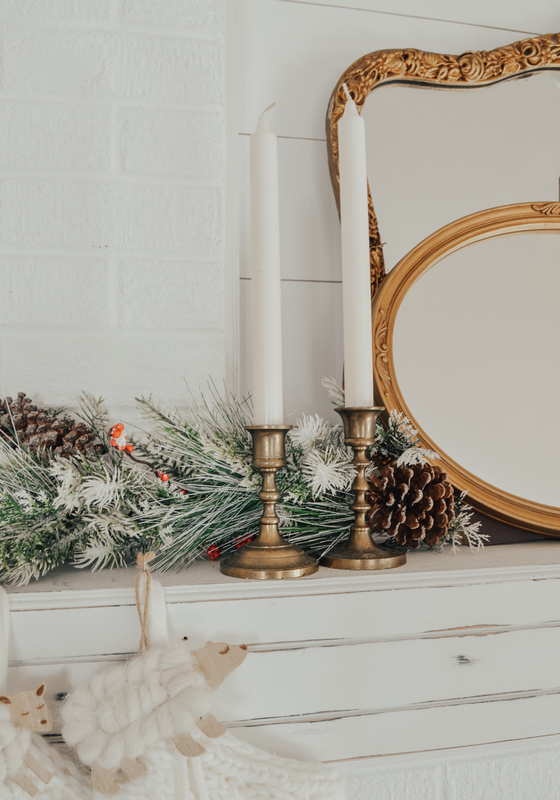 I know how busy this time of year is for all of us, so I really appreciate when you spend a few minutes of your day with me here on the blog. It means the world to me!! I’m not tired of seeing Christmas decor at all!! Keep it coming! Christmas is something that we look forward to for a whole year and before you know it it’s over! I really don’t understand how anyone could not like decorating for Christmas even if it’s just a tree and some stockings…and I can’t believe how many people lately have said they don’t like Christmas music!!! What????? Anyway, your mantle is beautiful! I love the simplicity and vintage look. I would love to see the treats you are making too! Thanks for sharing Sarah! Love it! So pretty, it’s perfect for your house! Yes, please share your holiday treats with us. And, I for one love to see your Christmas decor – keep sharing with us, the season is not over yet!! 🙂 … it continues to give me inspiration for my own home! This is absolutely stunning Sarah!! I have an obsession with antique gold/bronze framed mirrors also. I have 3 (also antique finds) and have a lot of white and soft gray throughout my house and I feel it makes the mirrors pop even more. Such a score for $35!!! It is beautiful and timeless. Thanks so much for sharing!! Sarah! It’s simple but so elegant & beautiful! I am loving the mirrors! I love all things Christmas! And yes, show us food! Thanks so much Kim!! Hoping to share candy soon, stay tuned!! No, I haven’t done a FB live but I should! Just need to get the nerve up to do it!! Simply Beautiful! Love it all, great finds and fantastic prices. You did good Girl! I never get tired of Christmas decorations so keep them coming. This year I decided to put mine up on November 8th. One month is just too short. And I’m still adding here and there. And Happy Birthday to our Lord, Jesus. Wow that’s great Carol! I’m glad you did that. Some years I’m in the mood for earlier Christmas decor and other years I like to wait. I just go with the flow from year to year!! i love the look!! gold and white.. simple elegance!! i look forward to your blogs each week!! 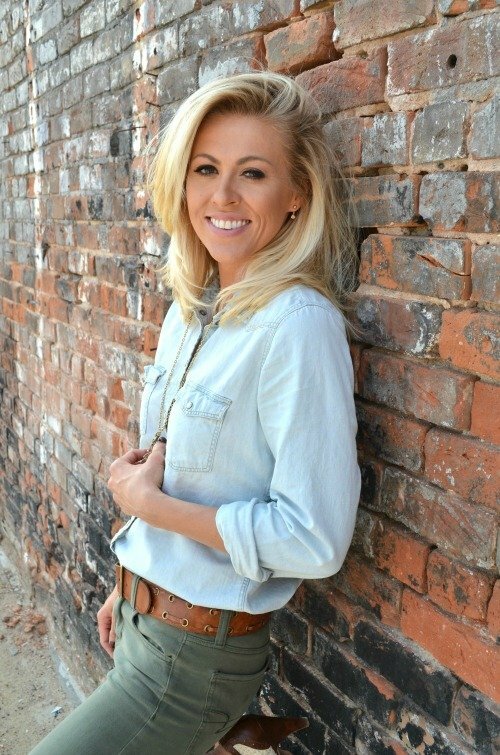 love your look/style sarah! and YES i would love to hear about the christmas goodies you make! Thank you so much Vivian! I am hoping to share our Christmas goodies and candy soon. Stay tuned! I loved your post and you pushed me over the edge. 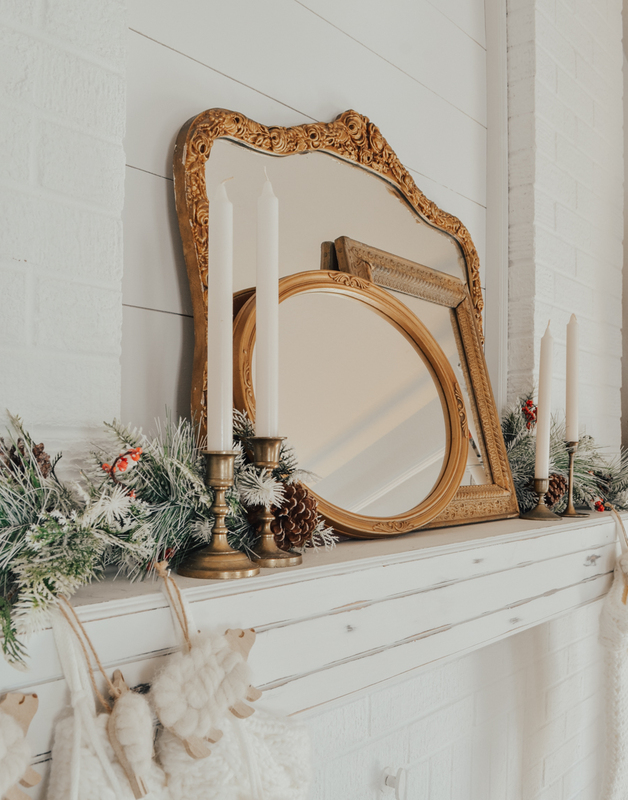 I have an antique mirror that I’d been thinking of using on the mantle this year and you convinced me. It’s really an antique – with the crazing on the back and everything. It’s going to look amazing. Thank you! Oh that’s so awesome Cheryl!! I bet it will look amazing. So beautiful! Simple and elegant. 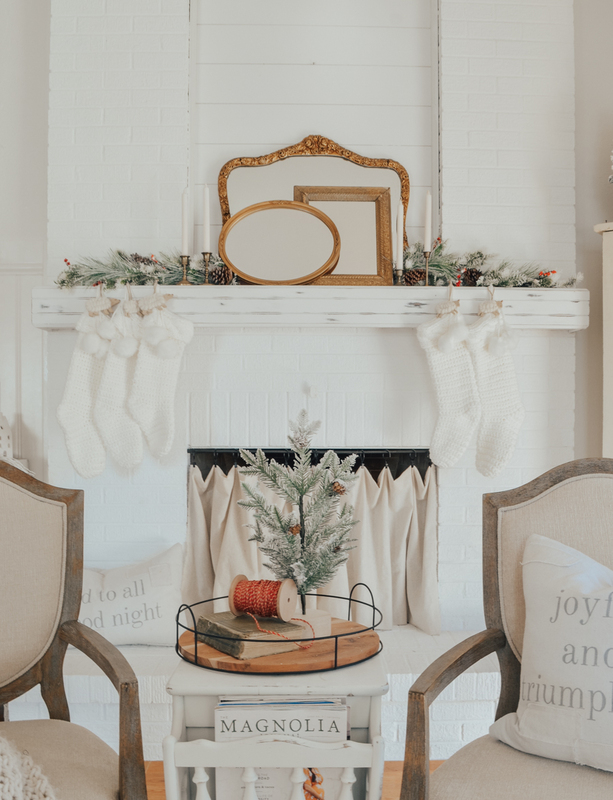 I’m enjoying all the Christmas decor posts, as I’m still working on my own decor, and even if I don’t use an idea this year, it may inspire me to search for items at after holiday sales or throughout the year at thrift/antique stores to use for next year! Would love to see more ideas throughout the year with this fireplace, it’s gorgeous! Thanks Vicki! I do need to share this fireplace more often here on the blog. I always overlook it because I feel like mantle looks can be boring? Need to do it more though!! Oh that sounds so beautiful Becky! I really don’t use mirror enough in my decor. I should have one in ever room! They bring so much light to a space. Love all your decor through out the year! You do an amazing job, especially love all the vintage decor !! Thank you for sharing, baking ideas would be good might ge me in the mood to bake. Have a blessed and healthy holiday ! Thanks so much Barb! And I’m hoping to share the Christmas candy soon. Stay tuned!! Keep the Christmas decor coming! 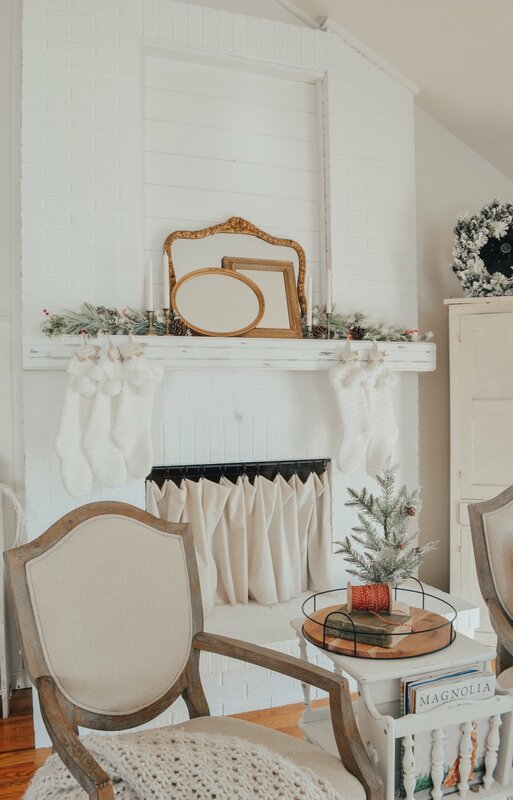 I love this time of year and I love to see how other people are decorating their spaces! I have some bronze candle sticks hanging out somewhere…maybe I will dig them up and add them to our mantel decor ;). Thanks for sharing. OH yes!! Dig them out and use them Monique, they’re perfect for this time of year! I like the look of the three vintage mirrors stacks against each other. Merry Christmas to you and your family. It looks perfect, Sarah! I’m really drawn to the layered mirrors look lately too. I love that you left them gold. 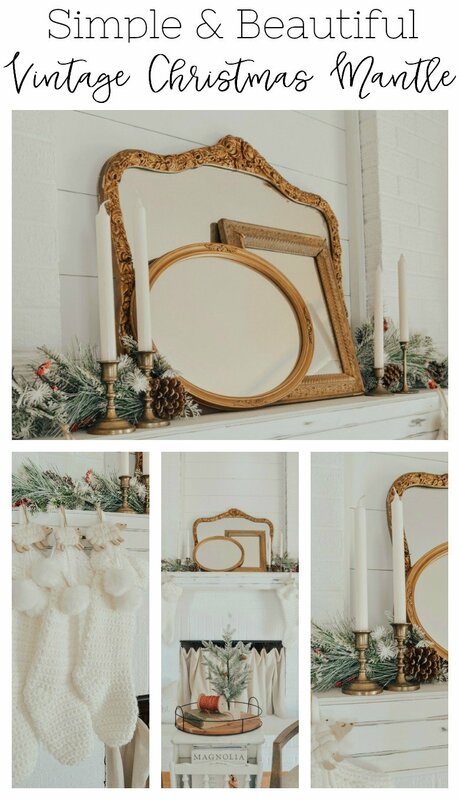 Please don’t stop sharing your Christmas decorating ideas, because I’m loving your style. It seems like you are becoming more drawn to a simple, basic look, lately, which I’m loving. (Perhaps that’s why you weren’t loving your shelf decor the other day??) It seems like maybe you’re craving more of a simple look, hence your thought that maybe a chair with a pillow would do. Thanks Kyla!! I think you’re right about the shelf decor. It’s too busy for that tiny little space. Pretty sure I’m just going to take that cabinet out all together and start fresh! Yes!! Isn’t she amazing? I love Liz’s style so much. Your mantle looks great! I really like the fact that you didn’t paint the frames of the mirrors. That may have been too much with the white mantle. I also love decorating for Christmas and appreciate your style. I agree Nancy, I think they’re perfect in that shade of gold. Especially for Christmas! Absolutely love it!!! Simple but so pretty. and I would love for you to share your Christmas treats with us!! Thanks Lois!! I’m hoping to share the Christmas treats soon! I am fairly new to your blog, and I love the inspiration you give me. I found you shortly before you went to the Silobration! Your mantle is lovely. I am all about painting everything! But your mirrors and candlesticks are so perfect! You have the best instincts!! Oh yay, thanks for sharing that with me Susan! So happy to hear my posts inspire you a little. That makes it all worth it!! Never tire of Christmas!! Fireplace looks beautiful! And yes please on the food! Thanks Cathe, hoping to share our treats/candy soon!! Hi Sarah, no I would never be sick of Christmas decor…please keep showing it…love it! I love the stockings and sheep. thanks Candy!! I’m hoping to share our Christmas candy soon! I for one am NOT tired of Christmas decor yet, and probably won’t be until the day after Christmas! The mantle is Vintage perfect. I’ll take that as a huge compliment!! Adore her. Love seeing all the Christmas Decor! Beautiful! Would love for you to share your holiday treats! Thanks Dacia, I’m hoping to share our treats soon!! Perfect just perfect -the simplicity is just beautiful ……less is best. I agree Marilyn–sometimes less is really better! Beautiful! You make it all so seem so effortless!